Day before the Big Race! On this day we thought we were going to be going out on a boat to see wildlife. Well…As often happens in life, things didn’t go according to plan. 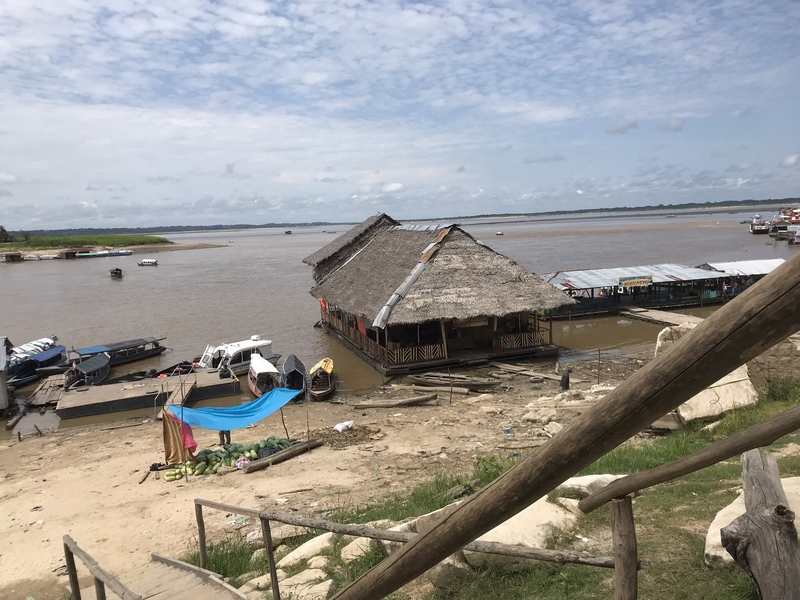 We ended up taking a boat up the Amazon River to Independcia a very small village overlooking the amazon. We docked our boat and went up a huge hill. There was a house in the middle of no where with a little table with beautiful handmade souvenirs for sale. This was my first opportunity to buy a souvenir. All the other times we had seen things- I did not have enough cash on me. (Things are inexpensive- I just hadn’t exchange cash yet). I was happy to find a cute little purse. This actually has ended up being one of my favorite souvenirs from the trip. We then went up this little lookout overlooking the Amazon with hammocks. It was a great place to relax and enjoy the views. I would have like to have stayed a little longer there relaxing and enjoying the view. Unfortunately, part of our group needed to use the overlook. I really only got to be up there for about 5 minutes. Most of the group came down and we went into the little village and explored. As we were walking up the sandy path through the village. There was a house with a Jaguar Pelt hanging in the doorway. We stopped to take a picture of it. As we were moving on- One of the kids from the household was taking it down for us to get a picture with it. I suspect- that it is a money making thing– and we had broken the rule by taking a picture. I didn’t have any more sol coins, only larger bills.– so I quickly headed on. I have learned in Peru- they generally don’t have change- it is best to pay with exact change. This felt like one of the hottest days of the trip. We spent about 5 hours in Indepencia and there was very little shade-we didn’t know how long we were going to be there- so we were mostly were waiting around. We spent a lot of time drinking water. I had hoped to find a little restaurant to eat lunch- but no such luck. We had only had the breakfast from the hostel of bread and fruit. I definitely was getting hungry and had time to think I about it. :). We did really enjoy the adorable Peruvian Kids They were a delight. Definitely added to the enjoyment of the day. After we left Indepencia we took the 45 minute boat ride back and then we needed to rush to the hardware store before they closed to get supplies for the race. We of course took Moto Taxi’s (My favorite). I think I could have spent half the day everyday riding around on Moto Taxi’s just for fun! I am sure that my group is sick of hearing me talk about how much I love the Moto Taxi’s! At the hardware store it was quickly becoming apparent that I was of no use. So in the end some of our group went to get dinner while the other half of the group finished getting the supplies. When we went to dinner we ran into the 3rd team of our group eating dinner. We joined them. By this time it was 9pm. We were starving and very glad to finally be getting Dinner. The rest of the group was even later getting Dinner. We ended up having to miss the Pre Race Celebration because food was a higher priority. As you can tell by this blog I was getting “Hangry!” I don’t do well without food. We ate at the Yellow Rose of Texas again. This is what I ordered. They tend to have a lot of American cuisine- but I liked to try Peruvian food when possible. I really liked my dinner it was Potatoes with a cream sauce, boiled eggs and olives. After Dinner it was time to pack up our stuff and get ready for our race! I went to bed full of excitement – The race that I have trained all summer for begins in the morning!!!! Next Amazon Raft Race- Day 1- Building a raft! I read these in the wrong order, but I enjoyed this one too. You’re doing a great job with this blog.